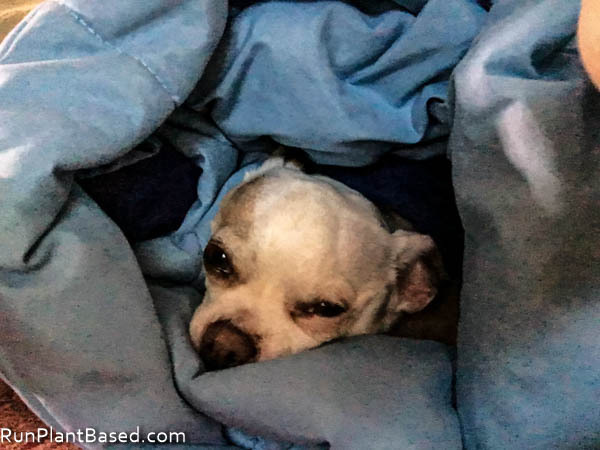 Miko has been doing a lot of his favorite thing all week – snuggling in his couch blanket. 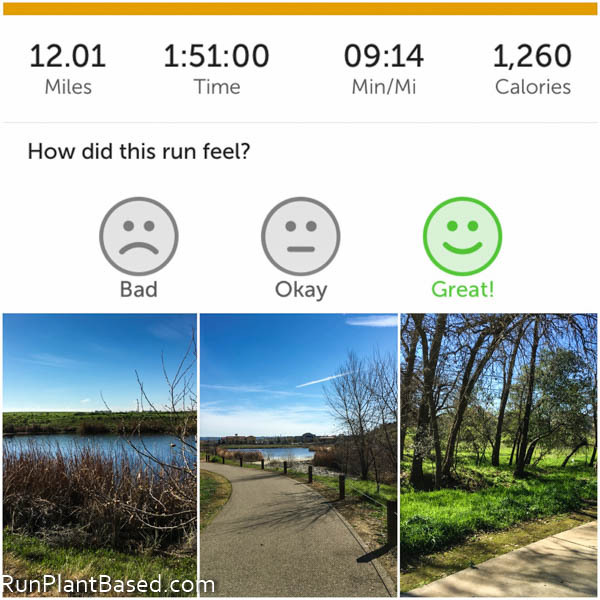 I’m on a 2 week countdown until the next half marathon and last week’s training run went really well. But I’ve been feeling a little tired, sore, and sluggish this week and hoping to get through today’s long run smoothly. The plan is to run the entire distance and maybe a little more to over train, then taper next weekend before the race and be ready to kick my pace up for it. 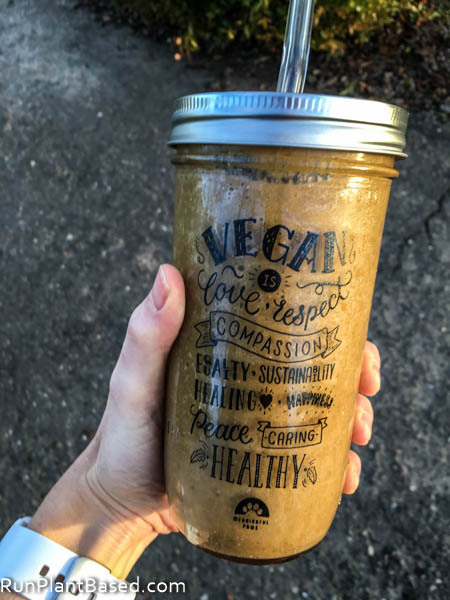 I’ve also been enjoying my new smoothie tumbler from Meaningful Paws and adding lots of ginger and chia seeds to smoothies this week. I was a little shocked to see Ben & Jerry’s new vegan ice cream at our local Target Sunday and had to grab one to try, turns out Chocolate Fudge Brownie is the lowest-calorie of the four vegan flavors. 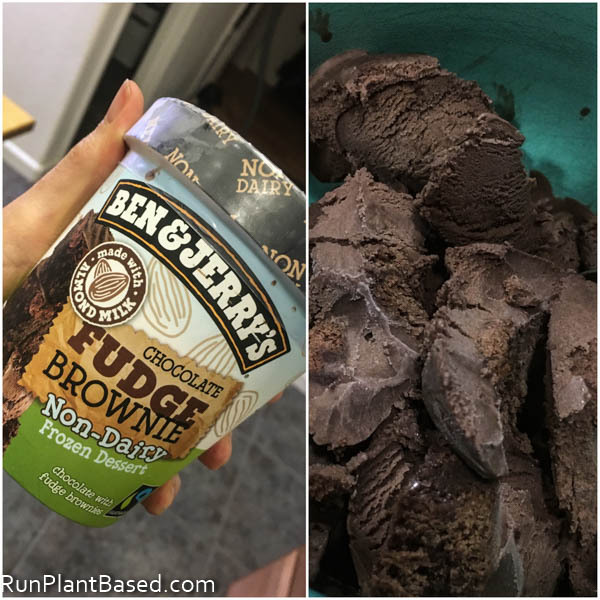 It was a little tough to scoop out being frozen solid which may have something to do with our freezer, but otherwise chocolaty and delicious with big brownie chunks in the ice cream. 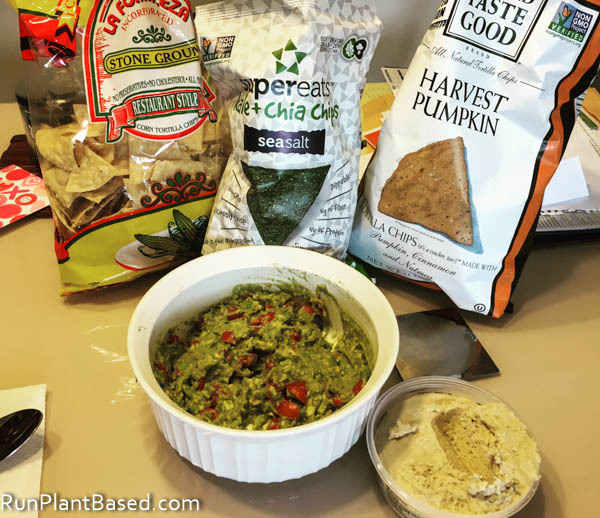 There have been other interesting eats this week too like this snack lunch I had with my mom to use up chips and avocados. Which was tasty, but not an ideal lunch. 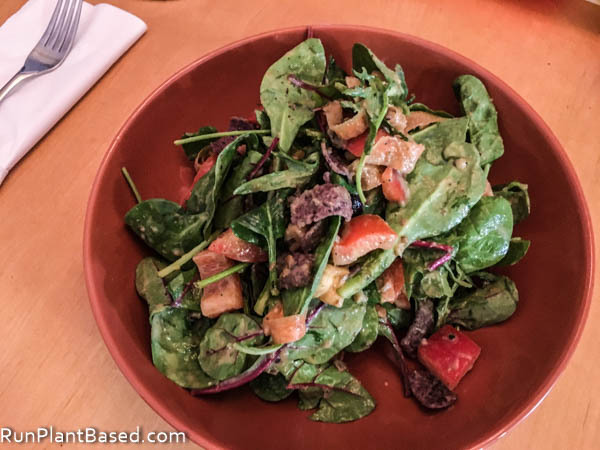 And a huge salad with avocado dressing and blue corn chips. 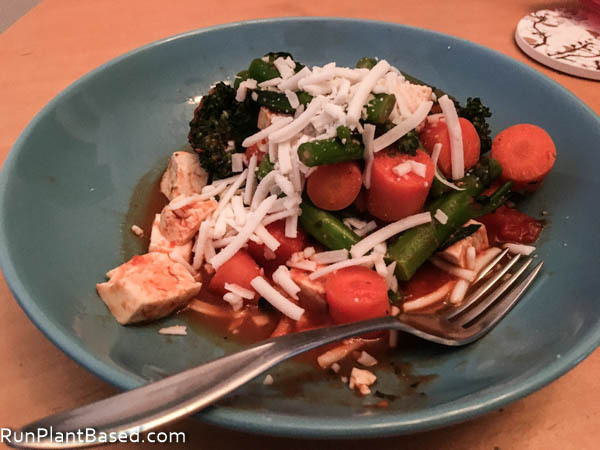 Tofu marina stir fry with vegan mozzarella shreds. 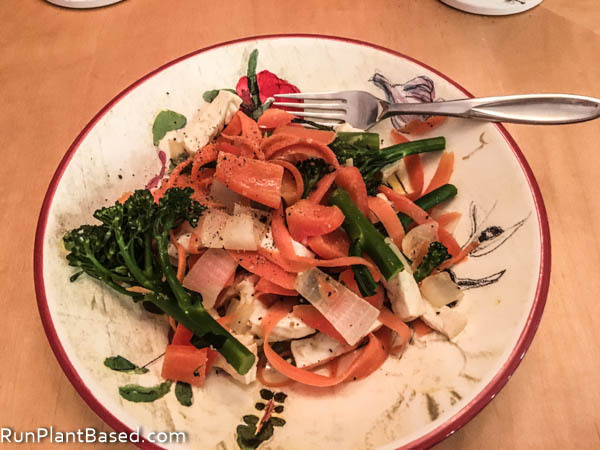 Another simple oil free tofu stir fry. And I had to share broccoli with Leela. 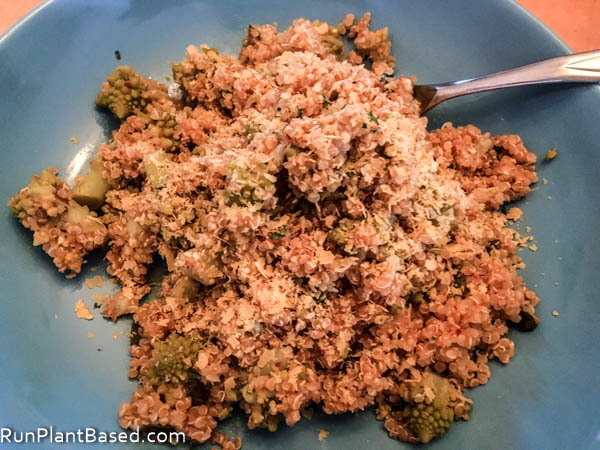 I got a couple of heads of romanesco broccoli in our farm box and I used one in a curry coconut quinoa dish. It made a hearty and filling dish, the quinoa absorbed the spicy curry paste flavors nicely giving it a lively kick. I spent Friday at a tech conference all day in Sacramento which is a nice way to get away from the office for a day. Since I’ve been spoiled by great vegan options at conferences in the past, I was not worried about this one. But I should have packed food because the options were a greasy grilled veggie sandwich, greasy pasta dish, and greasy potato chips. 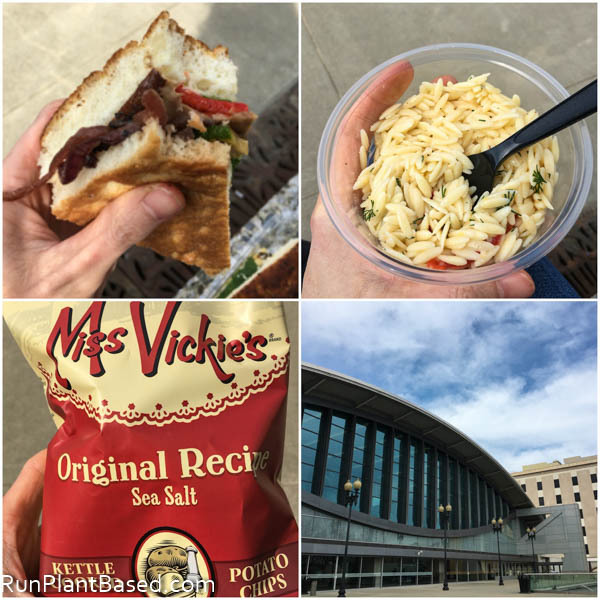 It was not a vegan limitation issue because the non-vegan options were equally horrible and greasy, at least my sandwich had some veggies! Seriously, how are conference attendees supposed to learn and stay engaged when the food served puts them to sleep and shuts the brain down?!? With such crappy catering I would have walked to another restaurant to grab food if I had time. Next time I’m packing better food just in case! Dinner probably wasn’t much better, but I am a fan of spicy Thai food. 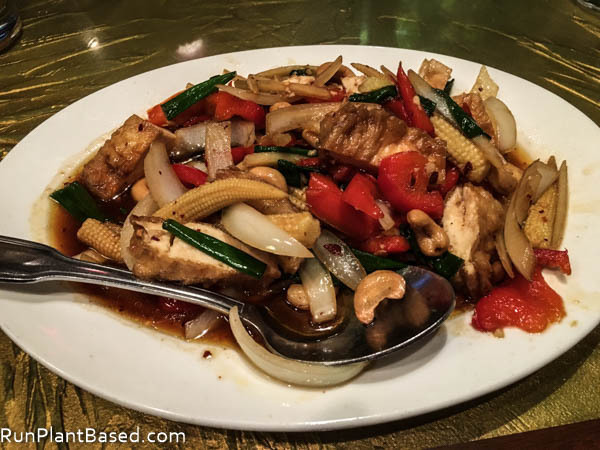 Hubby and I stepped out to our local Thai restaurant for cashew nut tofu stir fry. And it had a lot more veggies, so that’s good at least! And now I’m sipping coffee and trying to motivate myself for another long run. A little bummed it’s Sunday already, next week is going to be busy with projects at work and my turn to be on call for the week – never fun. But this week’s list is! The “manly” diet is making men sick. Time for another Berkeley road trip to check this place out! Here are videos from all the guest speakers from SacTown VegFest! And an inspirational story about one of the guest speakers. 33 ways to save water at home. Doing the “crazy vegan thing” worked for this guy. David Allen gives advice for avoiding decision paralysis. Interesting look at how a fatty diet promotes type 2 diabetes. Finally, I started added fennel seeds to my smoothies because of this. Yeah, it’s Runkeeper and I’ve been using it for the last 6 years and pretty happy with it. Nice run! I just made it up to 10 1/2 miles and it felt good. I’m looking forward to hearing about your results in the half-marathon. Thanks, I had to taper this Sunday because I was feeling the mile buildup! Haha, and I was thinking your avocados and chips was the ideal lunch! I was ready to dive in. And they are such good prices right now, so I’m thrilled. 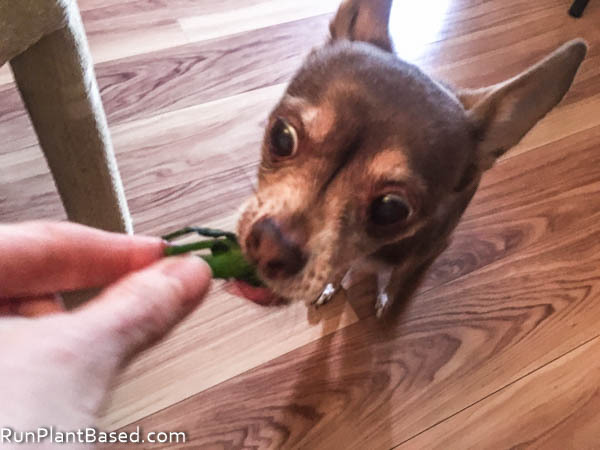 My girls both love guac, and they are reaping the benefits of all those healthy fats. And your running is amazing. I don’t suppose you could exercise for me today and burn a few calories for me? 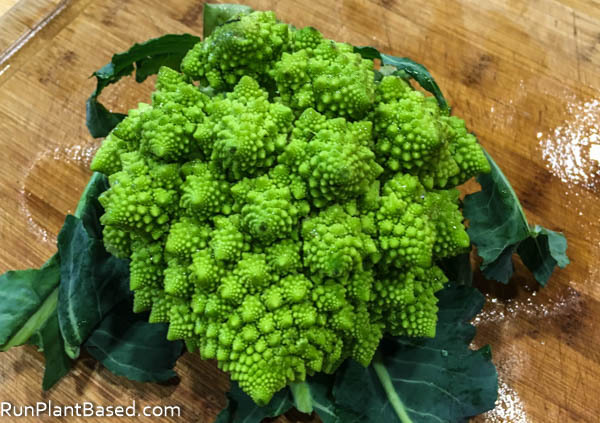 I was a Whole Foods on Sunday and saw romanesco but didn’t really know what it was. I didn’t realize it was broccoli! I’ll have to try it next time. I love those Meaningful Paws tumblers. I have been thinking about getting one and I think I may have to after seeing how cute yours looks. That’s a really interesting article on T2 Diabetes and fat. I’ve only started learning about how insulin affects the body etc so this gives me a new take on it. It’s good broccoli too, like a cross between broccoli and cauliflower texture wise. I thought so too on diabetes and it echoed a lot of what Dr. Neal Bernard said in a presentation last year about fat build ups in cells. My jealousy for Miko all wrapped up in your blankets is just……… HA! I need to calmmmm down! 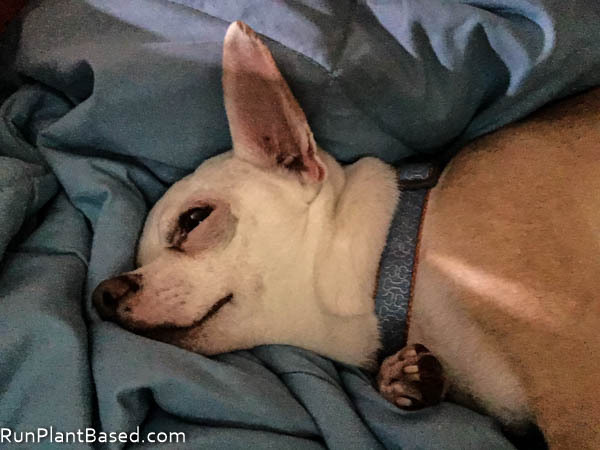 I am so envious, I wanna curl back up in bed! Mmmmm! Lol, me too with the way this week has been going! I tried the chocolate brownie ben & jerry’s flavor and out of all of them, I think it had the worst texture. It has the lowest calorie but it seems to effect the ice cream. Which makes me think to just ditch that one since there are other ice creams that are low calorie and tastier. But I liked the other ones a lot. They are perfect for a super indulgent treat. Interesting, I have not tried the other flavors yet and may need to grab them. Target only had that flavor at the time, but I noticed they have them all now. Thanks!